92 registered members (ArrestMeRedZ, 2009Edge, ammolab, 2015_PSD, bbhero, 12 invisible), 2,122 guests, and 31 spiders. I post UOA in the right section of the thread, or not? Did that previous thread get deleted? Good catch on it too, I missed it. This is 4 different samples from 4 trucks? Or one series of four samples, all from one truck? Lots of Fe there on some of these ... Vis also a bit low in some. I know about Fe and Viscosity. It's possible to do a % comparison with 4 samples. So are you selling the additive or just promoting it? So are you a user, or promoter, of the additive? does this affect the UOA results I show? Last edited by Alexey88rus; 04/11/18 02:17 PM. Just so people are aware is all. Of course it does, and never for the better. how can I influence on a chemical analysis? technically. When you're adding anything to the oil that wouldn't be there in the first place, you're going to be changing the mixture that is the motor oil. Now, ideally, if one is trying to do UOAs, it's best to have a VOA of what was put in there in the first place. Some additives really mess up the elemental numbers in UOAs, really making it difficult to see what goes on. Similarly, hopping oil brand to oil brand messes up the numbers, with residual oil. 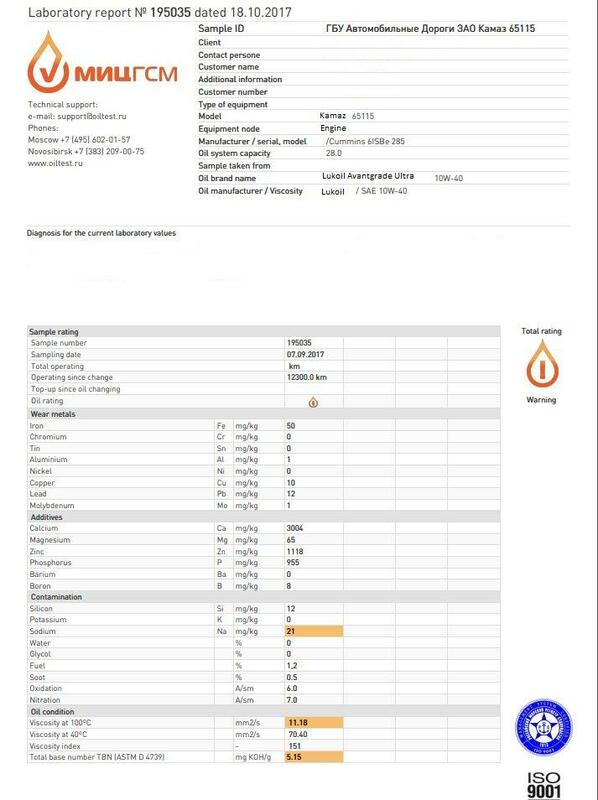 Now, others here with more knowledge will correct me if I'm wrong, but if I did feel the absolute need to run additives (I don't) and wanted to conduct UOAs, I would first wish to run a VOA of the engine oil in question mixed with the additive in question in correct proportions, so at least there's some baseline. Look at it even from a very simple example. 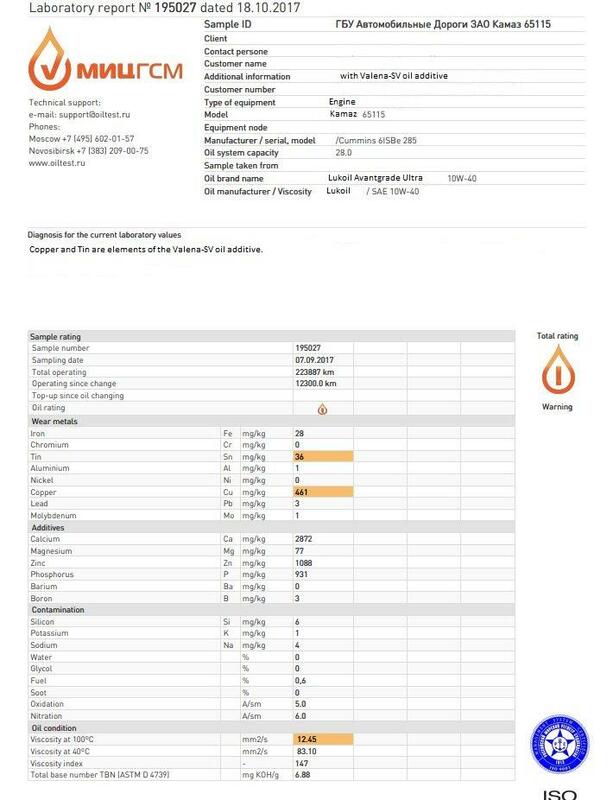 Let's say I'm running an ordinary ILSAC lube with 800 ppm phosphorus. 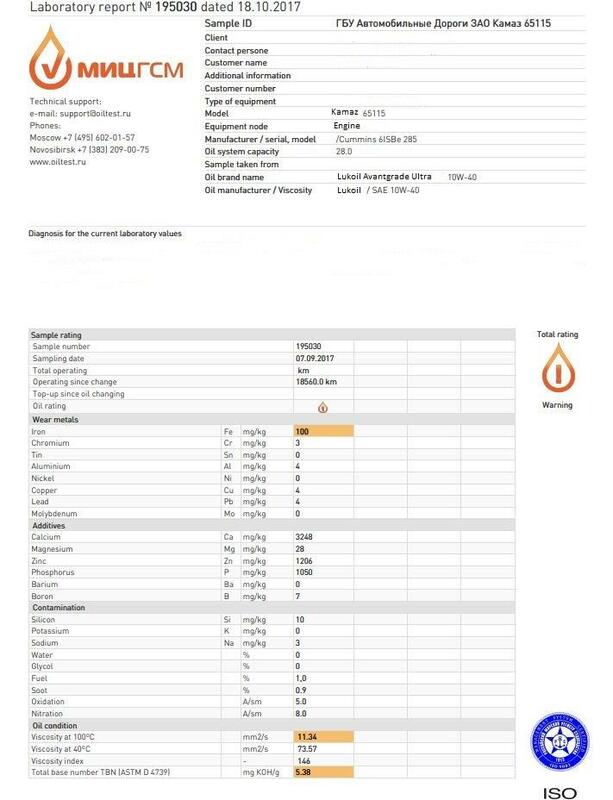 I dump in a whack of ZDDP additive of some sort, the analysis might show something like 1600 ppm phosphorus after the OCI. That certainly didn't come from running ordinary PYB 5w-30 SN/GF-5. Yes - it does matter. 1) the results are OK to post, but I don't know what they really prove. The Fe is high in a couple of them; there's nothing astonishing in these. So what's the point here? The additive is clearly visible in the UOA, but the Fe shows high wear rates. Four separate UOAs from four separate vehicles shows ABSOLUTELY NOTHING IN A STATISTICAL SENSE. You are welcome to your opinion, but mine is that this additive did zilch to improve anything, and the high Fe wear is not something I'd be flinging about the internet as a great achievement. While the additive may not have created the issue, it certainly doesn't give a glowing example, either. "4 different samples from 4 trucks, same route, same oil, same diesel... It's possible to do a % comparison with 4 samples." This would be the absolute minimum of understanding of how to use UOAs and do comparisons and contrasts. It goes much deeper than this, but this is a great place for laymen to start understanding how data should be collected, used and analyzed. 2) if you're going to promote a product in a commercial/business sense, you need to contact the administration and register as a site advertiser. Last edited by dnewton3; 04/13/18 05:14 AM.